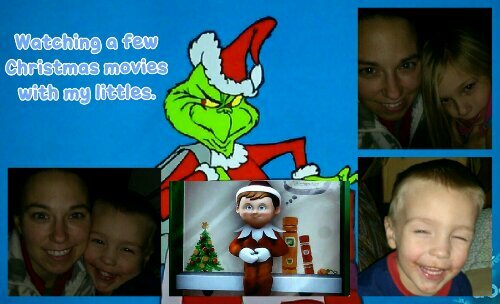 Watching Christmas movies on TV with the kids. Minus shopping, we really don’t start doing Christmas things until the day after Thanksgiving. For us, that’s the start of the Christmas season. Navy and I sat on the sofa watching How the Grinch Stole Christmas. I adore Dr. Seuss, though Navy wasn’t too interested. A little bummed the station/network started having sound issues in the middle. We started Shrek the Halls, which we’d never seem before, but the sound issues still hadn’t been fixed. It worked out though because Elf on the Shelf: An Elf’s Story was on, and Lily loves it. Lots of conversation on the lives of Santa’s elves and when Patrick, our elf, would be back. I hope he comes back this weekend. That would be nice.